Sadly, I’ve had to cancel some of my big races this year, including the Ironman 70.3 Augusta but it’s okay because I’m training for something much bigger. We’re expecting our first little fishing buddy next February! How do I feel? Excited and also occasionally queasy. I won’t lie that I am a little bit bummed that I won’t be competing in the Augusta 70.3 this fall, or the Disney Princess Half next February, but those races aren’t going anywhere and I am super excited to start our family. What about my other races? Honestly, no idea at this point. I’m really sort of playing it by ear. I’m probably safe to do triathlon until the end of my first trimester, but honestly after watching that guy eat it at the last one, I’m feeling less and less inclined to triathlon. I’m also having a lot more trouble than I already was with running or doing anything outside in our heat and humidity. As much as it pains me, I think I am probably going to be sitting the rest of this season out racing-wise. But just because I’m not racing doesn’t mean I’m not doing anything. I switched out my half iron training plan for Ashley Horner’s “Creating a Miracle” and so far I like it a lot. It’s still plenty challenging but also forces me to do more yoga, which I should really be doing anyway. So, after I got home Monday from the Rev3 Williamsburg tri, I worked the night shift and figured I’d just give myself the day off since I’d done a solid days’ work the day before. Then I also took Tuesday off, then Wednesday, then Thursday, and then it was suddenly Friday and I had to pick up my packet before work. I wanted to do this race because it was only 30 minutes from my house so it was super convenient. However, I didn’t realize that I was also working the night shift that week and night shift never gets off in time and then I’d have to get up early to get to the race to set up…and that I hadn’t really packed my bag or anything. I’m usually a really excellent planner and this was one of the few times where I just didn’t really plan it at all. I got home and did a tiny bit of work putting my numbers on my bike and oiling the chain and making sure I hadn’t left my helmet in Virginia. I also hadn’t unpacked since the weekend before (I really dislike unpacking) so fortunately(?) most of my stuff was still in my car. P and I debated about whether he wanted to get up early with me and go fishing while I was triathlon-ing. Now, to me we never came to a concrete decision of yes or no but I told him I was getting up at 5:30 and leaving by 6. I woke up at 5:30, he didn’t. I let the dogs out, fed the dogs, fed myself, and packed my bag and still no P. I figured he’d decided to sleep in. Then I took my bike out and he’d moved my bike rack onto his truck. Weird, I thought. But again, since he didn’t wake up I figured he must have changed his mind. It wasn’t until I got to the park and saw all of our fishing gear in the bed that I thought maybe he’d wanted me to wake him up…oops. Also I had both sets of car keys so even if he’d wanted to meet me out there, he couldn’t. I am pretty much the worst wife ever. Setting up went pretty quickly for me and then I had nothing really to do but wander around and admire the other pretty bikes. The water was 84.5 degrees so wetsuits were out of the question. Fun fact: ever since I bought my wetsuit, it has been too warm everywhere I go to wear it. I guess if you want to guarantee yourself warm water, buy a wetsuit. They grouped all the women together in one big wave (SUCH a big wave!) and to avoid getting pummeled I waited several seconds after the start before heading out. Even still, there were a lot of people and everyone bunched up a bit around the first buoy. The most surprising thing to me the whole day was just how good I felt on the swim. I felt calm and relaxed and even when I got a little fatigued I never felt like I needed to completely stop and catch my breath. I had also decided that since I didn’t do any solid prep work before this race, I wanted just do it by feel so I left my watch and bike computer at home. It was different and I felt a little naked and lost not being able to look at times, but ultimately I think I liked it better. The distance from the transition area to the bike mount/dismount was my only complaint. It was ridiculously long. So long that I had time to wonder if the time was getting rolled up into the T1 and T2 times. The bike course was reasonably hilly but enjoyable, except that there was a lot of drafting going on. At the first turn I tried to pass a group of people but they bunched up so much that I had to drop back because I couldn’t pass a group of six people all riding two by two. One of the athletes had a bad accident on course and after the race one of the women said she’d been there when it happened. A truck got annoyed by the cyclists on either side of the road and tried to zip between them, went too near a cyclist, who overcorrected on a steep downhill and ended up bloody and in the ditch. When I rode by the police car had moved to block traffic around him and when I came back they were loading him into an ambulance. I really, truly hate when people are jerks on the road. As I was explaining to P about why cyclists don’t and shouldn’t ride in the shoulder, jerks think then they have enough room to pass me and get much too close for comfort. If I ride in the lane, they’re more likely to be safe when passing me because it involves them entering the opposite lane. It makes me so angry that that driver felt like he was in too much of a hurry to pass someone safely and put their lives at risk. The run course was partially trail, which was nice, but also went down and up a very steep gully, which was not so nice at all. I was pretty done with the race after the gully and still had another 2.5 miles to go. Seriously. I stopped at all the aid stations and tried to find the happiness in running but honestly, I felt pretty crappy. I just wanted to be done. Finally I saw the finish line but I didn’t even try to kick. I was just annoyed by a lot of things that morning (neighbor playing loud reggae at 5:30 that I could hear inside my house, accidentally leaving P at home) and hungry and wanted to go home. I cleared my things out of the transition area and checked my time. Despite going watch-less, I was pretty close to my self-estimated time of around 1:40, even with all the walking I did on the run course. I also wonder how much quicker that time may have been without the extra distance from transition to the bike mount/dismount line. I have a couple of weeks until my next triathlon and right now I’m not sure if I’m going to do it or not. It’s an “intermediate” distance but I’m trying to just go by feel at this point. Fortunately, I’m also back on the morning shift for a while and I tend to be able to workout better on it. A couple of weekends ago I took some leave and drove up that weekend to spend some time with some friends from college and also figured I’d squeeze in a triathlon while I was visiting. I spent Friday night at her house, after some car trouble along the way, and the Saturday we dropped my bike off in Williamsburg before heading to Richmond to meet up with our other friend. Her house was about the same distance to Williamsburg as Richmond so either way I was going to have a little bit of a drive. They ran a sprint and some kids races on Saturday so we drove over afterwards. I was so impressed by what a big race this was and how well organized it was, too. Triathlon was completely novel to my friend so it was sort of fun showing her around and explaining to her the different things. Also, Rev3 has really nice packet bags. I got a reusable shopping bag with a nice t-shirt, a visor, and several samples of different snacks. I wish I had taken a picture of it all, but I didn’t even think of it until just now. In hindsight, I maybe should have just gotten a separate hotel for that night because it would have been easier to get my mind into the game. I had trouble sleeping and I had a lot of doubts swirling around in my head because it was my first olympic-distance triathlon. I told myself I’d feel better in the morning and if I didn’t, I could reassess then. I felt way better that morning and got up with enough time to head out and stop and get something easy to digest for breakfast. I like to have an hour to set up my area so I can eat, use the bathroom, and not be stressed. Rev3 was running a half iron distance about thirty minutes before the olympic distance so by the time I got to the park, things were very busy. I had to make several trips back and forth from my car to the transition area because I kept forgetting things. Finally I had time to eat my food and then decided to go watch the swim waves start. It’s a good thing I did, too because they decided to move everything up half an hour. I wandered over just as the folks in silver swim caps (I had a silver swim cap) were entering the water and waiting for the start. I rushed in, threw on my cap and goggles with ten seconds to spare. The swim was in the Chickahominy River and mostly pleasant, aside from the one guy who kept trying to swim on my feet and legs. I got kind of annoyed by that after the fifth time it happened so I spent some time splashing a lot to get him to sight and go away. My doubts came back and I started wondering if this was just a bad idea and if I should just scratch. I just felt really, really tired and another two events seemed insurmountingly hard. I switched to a two-stroke breathing pattern and that made me feel a little better and then told myself I’d finish the swim and then reassess. The last 100 meters or so the river shallowed a lot. I went to tread for a minute and the bottom was right there. Some of the taller people were hitting it with their arms with every stroke. As a result, all that river silt got kicked up and thoroughly coated me in a fine layer of dirt that later dried. Lovely. I took some extra time in the transition area, ate a Stinger gu, drank some water, and felt a lot better so I headed out for the bike. I learned that I am a very slow cyclist, especially when I compare my average pace to the others in my category. I am slow. But I really enjoyed the course. It was mostly shaded (thank goodness because it was hot that day in Virginia) and only some gentle rolling hills and lots of pretty country houses and farms to look at. I felt really positive during the bike, even as it seemed like everyone and their mother was passing me. Finally I hit the transition and headed out on the run. Again, the run was mostly shaded and the only big challenge was running over the huge bridge over the Chickahominy just after the start and right before the finish. I was concerned about overheating so I walked at every aid station and drank water and they also had Coke, Powerade, and these amazing ice cold sponges that I stuffed down the back of my sports bra and felt amazing. I also threw the ice from my water down the front of my sports bra and although it made me sound like a soda while running, it felt great. I was so happy to see that Chickahominy bridge the second time because I knew I was almost done. I tried to smile for the finish but it sort of looked like a grimace. I was good and tired by the end of it and so was also overjoyed when they gave me a sports towel that had been soaking in ice water to drape over my shoulders. I used some of it to clean off the dried dirt on my chest, arms, and neck. Rev3 put on such an amazing event. They had booths from different vendors and also a barbecue for the finishers. I wasn’t very hungry but I ate some baked beans and an oatmeal cookie and got a ten minute session in some Normatec boots that really helped ease my tired legs. I was in the mood for a caffeine pick-me-up before I tried to drive home that night (spoiler: didn’t make it, spent the night just inside the 250 mile radius of work) so we went to American Brew, the coffee/whiskey bar owned by one of my heroes, Ashley Horner. I was happy just to be drinking a latte there when Ashley herself actually came. I was too starstruck to say anything to her, but she say my race tattoos still on my arms and asked what race I did. We had a chat about triathlons and swimming and I told her I was a huge fan and asked for a picture. I’m always nervous meeting new people, especially when it’s someone I admire because not only am I a little worried I will act or say something stupid, but I also don’t want to be disappointed by them. I’m so happy to say that Ashley was as unbelievably kind and warm as she comes across in her posts and videos. I was so thrilled to meet her in person and between finishing my first olympic distance tri and meeting her and also getting to see two of my best friends, it was a really incredible weekend. 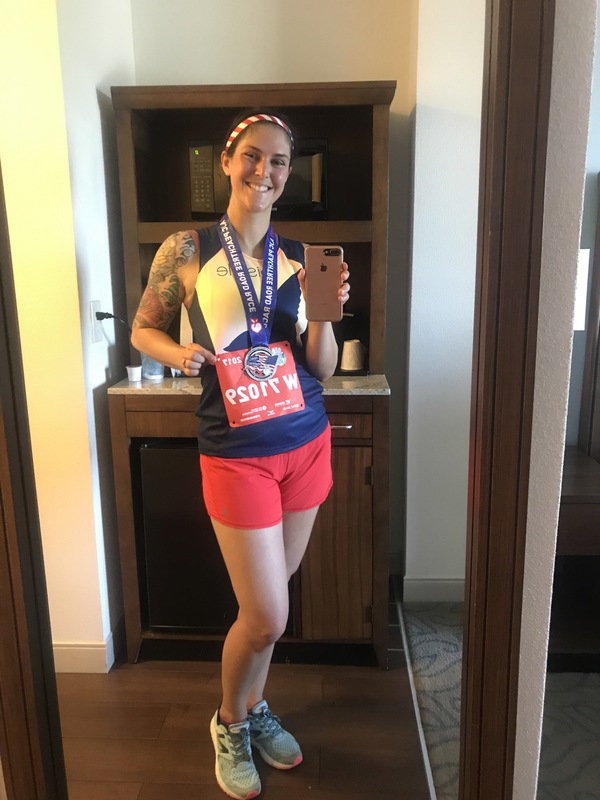 I’ve wanted to run the AJC Peachtree Road Race in Atlanta for several years, but it just never worked out for my logistically to plan a trip around it. I was thrilled when I found out that I was moving back to Georgia earlier this year and immediately went to register for it only to find out I’d missed the opportunity to guarantee and entry by joining the Atlanta Track Club by about a week. Fortunately, there was still the lottery option so I entered and back in April found out I’d been chosen. The Peachtree is held on the Fourth of July every year in Atlanta and is a big tradition. Lots of families run it together and there are many people who run it year after year. It’s the biggest sanctioned 10K in the US as well and while I’ve run big races, they’ve all been marathons so I was curious as to how they’d manage to get 60,000 people through a 10K course. My original plan was to drive up the morning before, but since I’d registered from Alaska before I had a Georgia address, I’d also chosen to pick up my packet at the expo so it was easier just to drive up the day before, go to the expo, and spend the night, run the race and drive home the following day. I found a Hilton Garden Inn near the finish line and by the MARTA station and booked a room there. Side note: parking was $30/night and there were cheaper garages the next block over, I’d do more research in the future because $30 is crazy. I drove up, checked into the hotel and decided to get some lunch at a noodle place near Georgia Tech. From there it was only supposed to be a 30 minute walk to packet pick up – it was a 30 minute sweat fest. It was hot, sunny, and my Jacks were not as broken in as I’d thought they were. By the time I’d marched my way to the Georgia World Congress Center and realized the expo was at the building furthest from anything, my feet were decidedly unhappy with me. I got my packet and realized I must have thought this was a longer race and given them a half marathon proof of time. They had corrals all the way back to Z and I was in W and my corral didn’t start until 0900, when it would definitely be hot and there was a red alert in effect for race day. I already hadn’t planned on running this for time but now I knew I’d need to be more conservative than I’d planned. I limped my way back to the hotel where I changed shoes and did some recon on the MARTA route which conveniently led me to the Lenox Square mall where I did some shopping before heading back to Midtown for dinner and an early bedtime. I got up early as usual, which was good since the MARTA was very crowded. I got to the start about an hour and a half early and had time to eat a little breakfast and sit in the shade while watching my corral. Most people were wearing some variation of red, white, and blue and I saw a few people dressed up as characters from American history. We started promptly at nine and immediately, people were walking. Again, I wasn’t out to break any landslide records or even PR, but it would have been nice if they’d reminded people to walk right and run left because the entire 6.2 miles was just people walking four and five abreast all over the road. It was super annoying. There was a lot of beer and snacks offered on the course, but it was so hot that I didn’t want to eat or drink anything that might make me sick. I stopped at all the aid stations for water and walked mostly up the biggest hill at mile 3.5 because I felt like I was starting to overheat a bit, plus the people around me were slowing to an even slower walk and I was frustrating trying to run around them. I finished up around wave J, which is probably about where I would have been had I submitted a correct proof of time. At the same time, I know I put what race I was submitting included distance so I don’t know why it didn’t just go by my average pace and not total time. Once past mile 5 it was a lot better, but right before the finish everyone just completely stopped as far as I could see. I heard that someone may have fainted at the finish line and they were trying to aid them, but everything was so backed up by that point it was insane. Eventually we made it through at a walk and I collected my t-shirt and some water and a snack box and navigated my way back to the hotel. I thanked the Ghost of Christian Past again for booking a hotel by the finish line because I was able to shower and change before checkout time which is always a huge mood booster in my book and I was thankful not to have to ride MARTA back anywhere while hot, sweaty, and smelly. Also, I didn’t get any safety pins with my packet. Fortunately there was one in my travel kit and I used some thread to see the other side onto my singlet. Overall, it was an okay race. It wasn’t as much fun as Disney races and I think that had a lot to do with the heat, being in the wrong corral, and just complete lack of runner courtesy and them not reminding runners of it throughout the course. I finished in 1:10, and 20,740 out of a total of 55,413 runners who finished yesterday. That is probably my slowest 10K time ever, and still middle of the pack if that says anything about the heat and amount of walkers yesterday. I may give it another chance next year when the weather will likely be better, but it’s not at the top of my list of races I want to do. When I moved to Alaska I made a big bucket list of all the Alaskan things I wanted to do. I didn’t get them all (partly because I didn’t truly understand how enormous Alaska actually is) but it was a lot of fun to make the list and try to cross things off. Catch a catfish. I tried a couple of years ago down in Columbus and successfully fed an entire container of chicken livers to the catfish while catching none. I have a few more tricks now that I’m eager to try out.